Assistant Professor Arash Kheradvar, M.D., Ph.D., The Edwards Lifesciences Center for Advanced Cardiovascular Technology, Department of Biomedical Engineering, has co-authoredVortex Formation in the Cardiovascular System. Vortices occur in nature wherever propulsive flow exists, from erupting volcanoes to ones generated by squid and jellyfish to propel themselves. There has been particular interest in the wide variety of vortices that develop in the cardiovascular system, particularly in the cardiac chambers and in large arteries. These vortices play fundamental roles in normal physiology and provide proper balance between blood motion and stresses on the surrounding tissues. In contrast, formation of unnatural vortices may alter the momentum transfer in the blood flow and increase energy dissipation. The book, co-authored by Dr. Gianni Pedrizzetti, Ph.D., University of Trieste in Italy, discusses current state-of-the-art vortex formation, from the basic physics to cardiac physiology. There is a particular focus on the formation of vortices at different locations inside the heart, the effect of cardiac devices and surgery on vortex formation, fluid dynamics of artificial heart valves and ventricular assist devices. 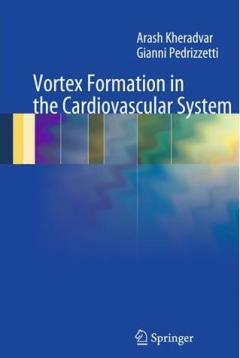 The book provides physical, mathematical and engineering concepts related to vortex formation into a clinical perspective with the objective of advancing cardiovascular patient care. It represents a comprehensive and valuable resource for those involved in the field of cardiology and cardiovascular physiology, cardiovascular surgeons, interventional cardiologists, biomedical engineers and researchers in fluid mechanics.